When the weather gets nice for outdoor dining, I always like to take advantage. 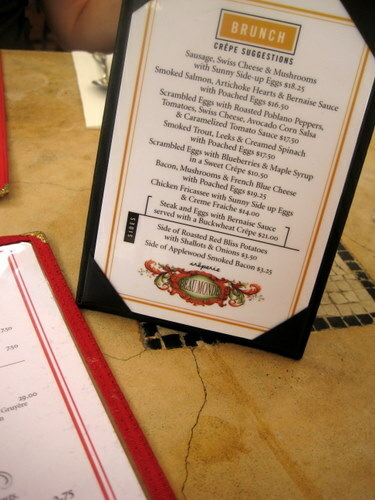 One of the nicest spots to dine al fresco has and always will be Beau Monde. They even have umbrellas so you can avoid the evil direct rays of the soleil. Yeah, I speak francais real good. 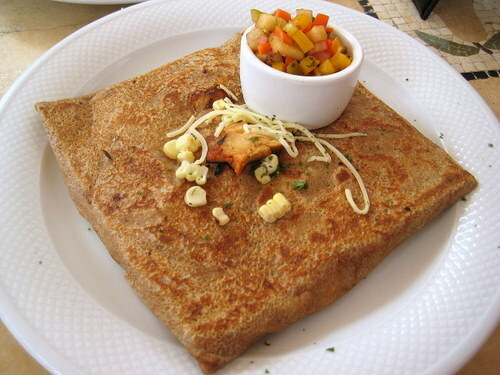 I got the savory crepe of the day which was some type of grilled chicken breast with chipotle and grilled corn and cheese and a side of apple pepper salsa. It was pretty good, but surprisingly not nearly as flavorful as one would have guessed. Despite all the color, ingredients, and hoopla, it was rather bland. 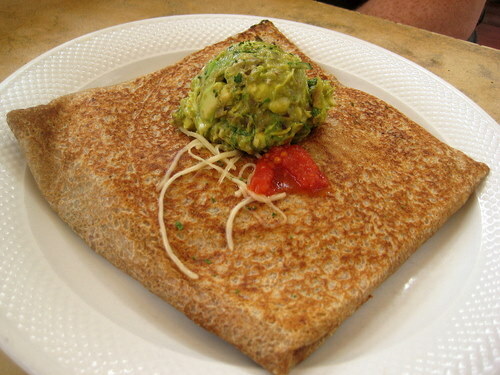 This is B’s savory crepe – scrambled eggs with roasted poblano peppers, tomatoes, swiss cheese, avocado corn salsa, and caramelized tomato sauce. It’s one of the recommended brunch crepes and this one definitely won out. It was so much better than mine and this one’s hoopla ended up with a wonderful combination of flavors! Maybe I’m better at picking sweet crepes.